Dr. Santagato is a Passaic County NJ Physical Therapist, licensed to practice in the state of New Jersey. He attended Rutgers, The State University of New Jersey, where he graduated on the Dean’s List with a Bachelor’s degree in Exercise Science and Sports Studies. He went on to Touro College in Manhattan, NY and received his Doctorate of Physical Therapy degree. While at Touro, Dr. Santagato was honored with an academic award for being in the top of his graduating class, as well as a research award for balance testing to prevent falls in the elderly community. Dr. Santagato believes in being up to date with the latest research and techniques within the field of physical therapy to always offer his patient’s the latest therapeutic treatment available. As a Passaic County NJ Physical Therapist, Dr. Santagato believes every patient deserves an individual treatment program designed specifically to meet the patient’s goals to regain full functional ability. Dr. Santagato has recently become Level 1 Certified in the Selective Functional Movement Assessment (SFMA) which is a diagnostic system which systematically finds the cause of the pain by logically breaking down dysfunctional movement patterns. He believes strongly that through the right program and attitude everyone can regain optimal functional ability. In addition, Dr. Santagato is also a Graston Technique provider for northern New Jersey. Graston Technique is a specific type of soft tissue mobilization using specific Graston instruments that treat fascial restrictions and scar tissue. Graston Technique is specifically successful at treating a multitude of injuries including but not limited to tendinitis such as; rotator cuff, biceps, or Achilles tendinitis, epicondylitis such as golfers elbow or tennis elbow, trigger finger, plantar fasciitis, IT band syndrome, knee pain, muscle, and ligaments sprains and strains. Graston Technique has been clinically proven to eliminate pain, restore ROM and restore functional ability in a shorter treatment period. Dr. Santagato is also certified in Pre & Post Natal Corrective Exercise to help improve the quality of life for all future and present moms. Dr. Santagato was inspired to help pregnant women when his wife was pregnant with their first child and experiencing terrible back pain. Through this course, he has become trained on the importance of breathing and corrective core strengthening for pregnant women or women who have recently given birth. Dr. Santagato has gained much clinical experience over the past years in an out-patient, Orthopaedic setting and is comfortable treating all Orthopaedic conditions from pre and post-operative, spinal disorders and sports injuries through hands-on manual therapy, therapeutic exercise, and modalities. 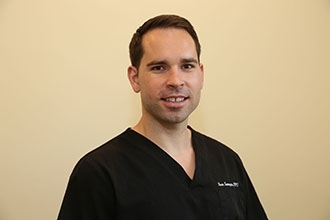 He has over 7 years of clinical outpatient experience. In his free time, Dr. Santagato enjoys spending time with his family and maintaining a healthy lifestyle through exercise and diet. This is what led him to pursue a career in physical therapy where he can help people who are in pain or injured adapt a new lifestyle to help them make a full recovery.